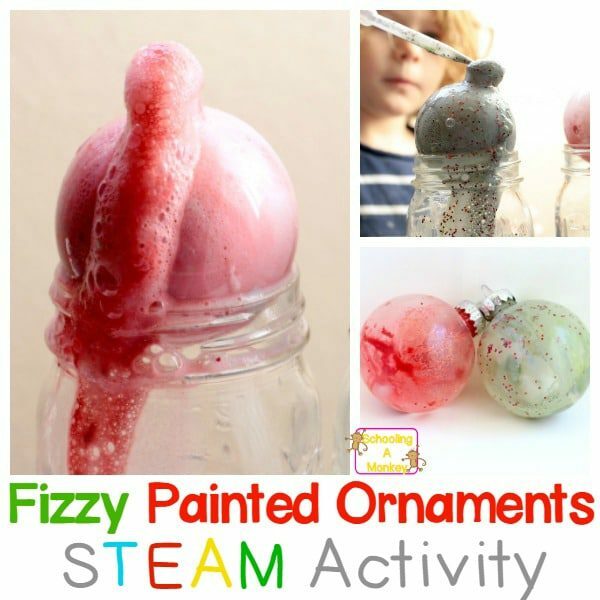 Make your Christmas STEM activities last when you make these fizzy painted Christmas ornaments using baking soda and vinegar chemical reactions. 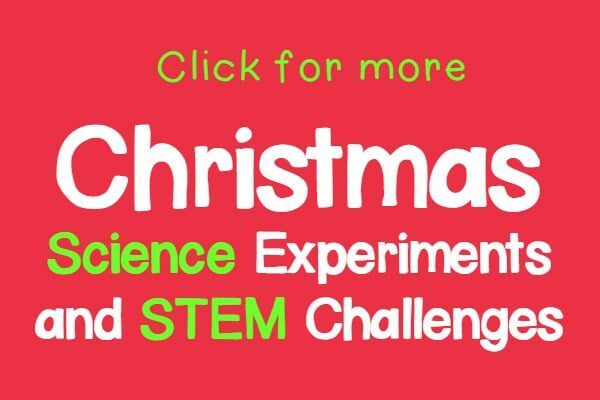 When it comes to mixing Christmas and science, you have to think outside the box a little bit. 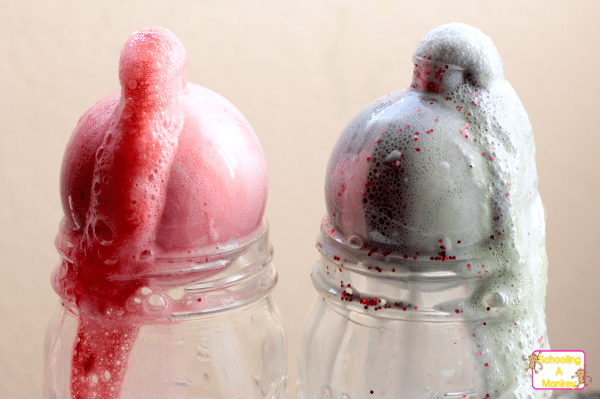 My kids absolutely love making baking soda and vinegar eruptions, so I knew I wanted to incorporate it into our Christmas STEM activities this season. However, I didn’t want the experiment to just be a one and done sort of thing, so I tried to figure out a way to make the results last permanently. 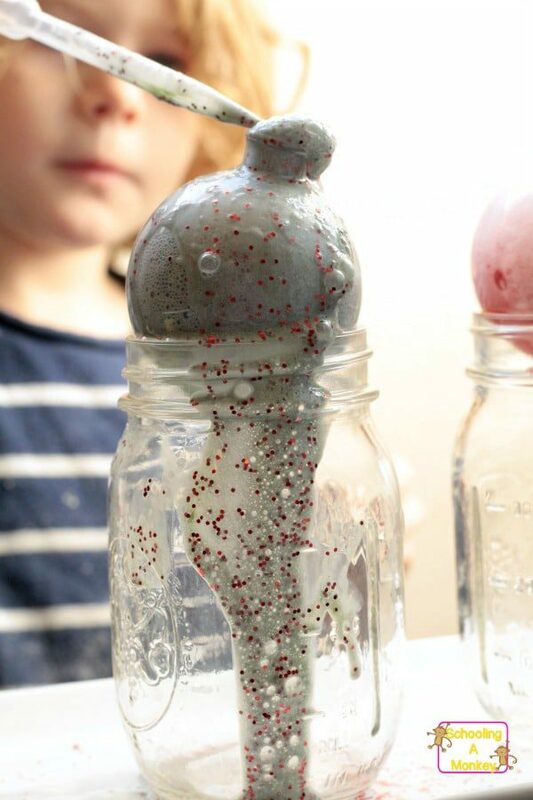 Lucky for me (and you), this fizzing Christmas ornament experiment was a total success! 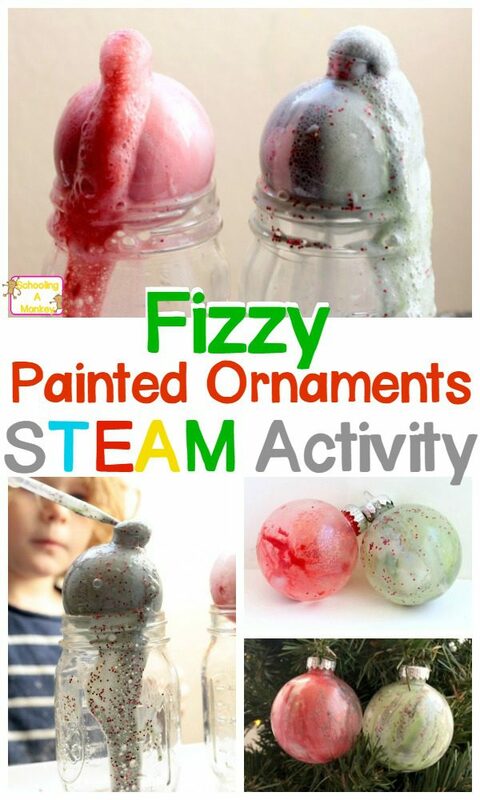 You don’t need many ingredients to make your own fizzing paint Christmas ornaments! I let the girls pick two colors of paint each, because I wasn’t sure how the colors would mix as the experiment progressed. Bo chose silver and green and Monkey chose sliver and red. 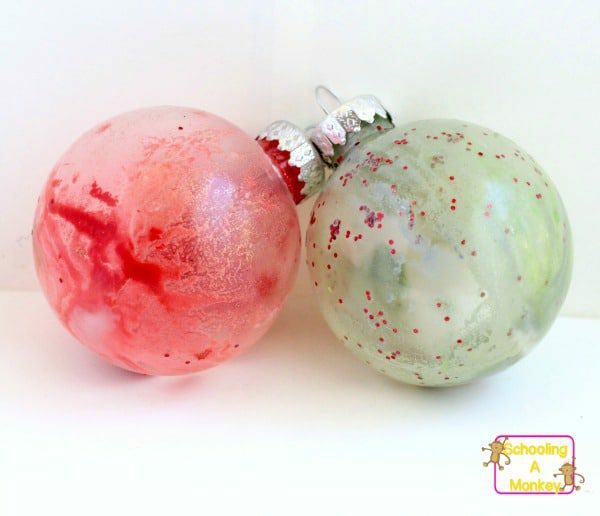 They both also chose to add a sprinkle of glitter to their ornaments. I set the ornaments upright in a mason jar and set them on the tray (this is to catch the drips). The girls dropped the paint in (about a teaspoon of paint per ornament) and then I added a tablespoon of baking soda and a drop of dish soap on top of the paint. The girls dipped their pipettes into the vinegar and gently squirted the baking soda with the vinegar. 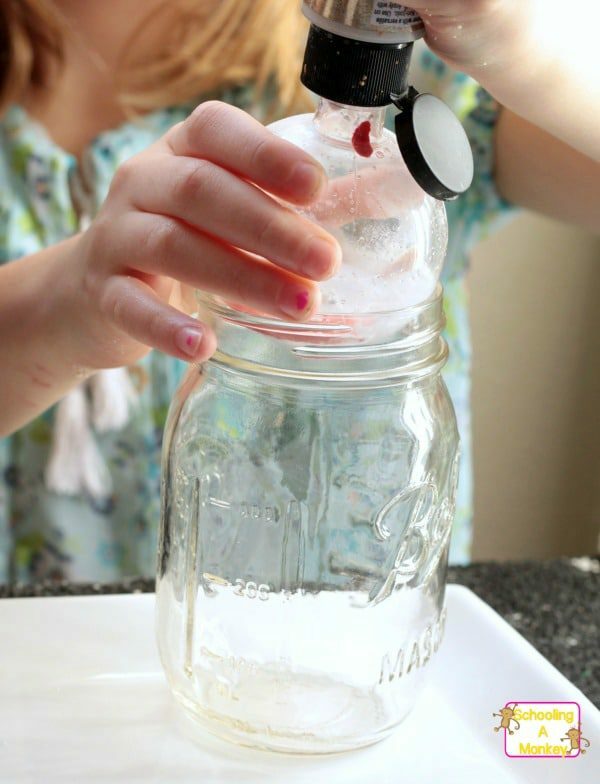 They kept adding vinegar until the bubbles started to come out of the top. I was afraid that too much vinegar would make all the paint leave the ornaments, but that didn’t seem to happen. 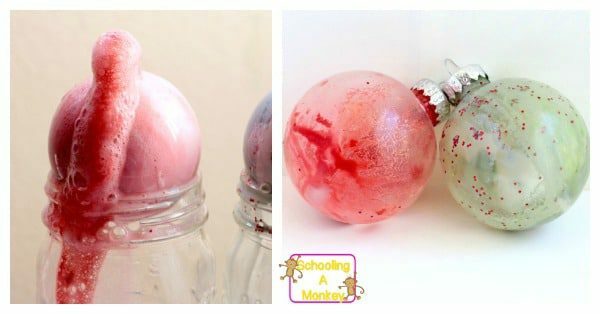 The girls didn’t flood the ornaments with vinegar, but they did put about four pipette’s full of vinegar into each bottle. 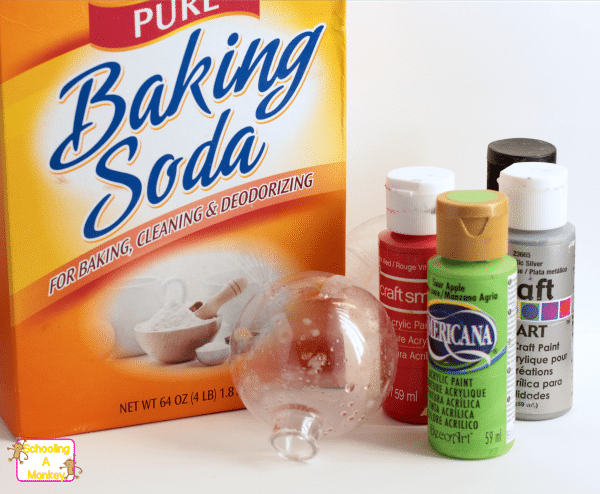 When the foaming slowed, I took the ornaments over to the trash and dumped out the vinegar. We then turned the ornaments upside down over the mason jars and set them in a window to dry. The next day, the ornaments looked like this and were perfectly dry. The girls were so pleased to see the results of their experiments in paint form.